Just over a week before the snap election that Theresa May called buoyed by a massive lead in the polls, YouGov’s first seat by seat projection of the campaign suggests that the Tories will now fall 16 seats short of an overall majority. This would be a shocking result – especially as Theresa May’s u-turn on calling a snap election she previously insisted would not be in the nation’s best interest was in the name of giving her an even bigger parliamentary mandate before the Brexit negotiations clock runs out. Despite most media writing off Jeremy Corbyn and hostile press coverage, a popular Labour manifesto promising to protect institutions such as the NHS, schools and policing has helped his party close the gap with the Conservatives – far from the electoral wipe-out May was hoping for. 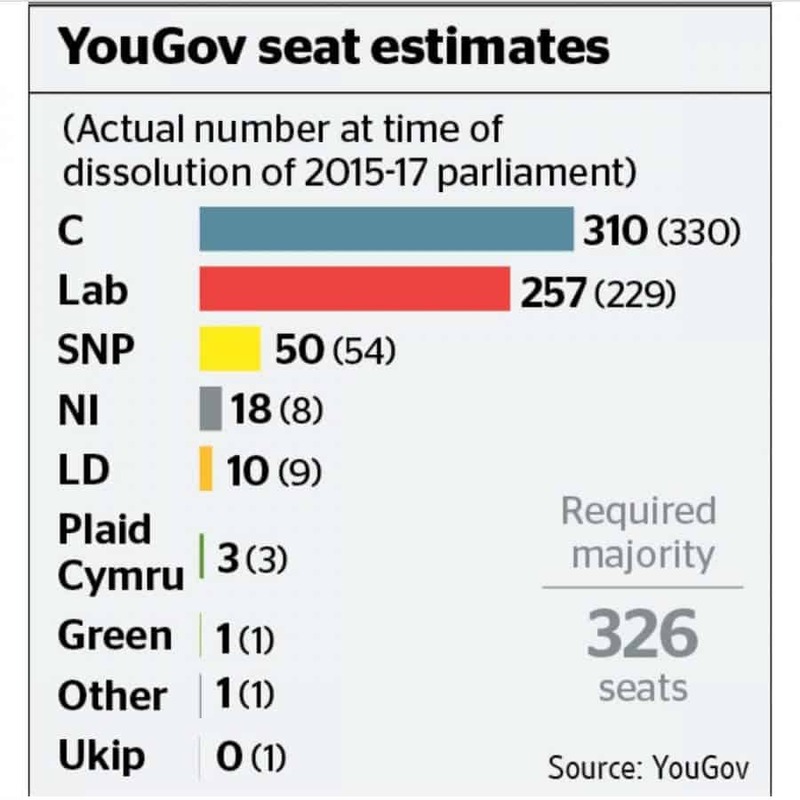 If this shock YouGov seat by seat survey of 50,000 interviews conducted for the Times accurately predicts the June 8 result, even if the LibDems campaigning on an anti-Hard Brexit platform somehow form a coalition with Theresa May, she would still fall short of the 326 seats she needs to form a majority. And the Northern Ireland parties are even more set against leaving the European single market and customs union than the LibDems because of the disruption to livelihoods and life both sides of the Irish border. This time last year David Cameron took one of the most ill-judged gambles a British Prime Minister has ever taken with the EU referendum and he paid the price for his arrogance. Will history prove Theresa May’s reckless folly has been even bigger now? According to this latest constituency-by-constituency modelling by YouGov just nine days before the general election, rather than increase the comfortable 17 seat majority she enjoyed, Theresa May is now looking at the humiliating prospect of losing 20 of the 330 seats Conservatives currently hold, while the Labour Party could gain nearly 30 seats. According to The Times, YouGov’s constituency by constituency model was based on polling over the past week which now puts the Tories at 42% with Labour on 38%. – This is the narrowest gap yet since Labour started catching up with the Tories following controversies such as their disastrous manifesto dogged by embarrassing u-turns, a refusal to rule out tax rises and unpopular policies such as punishing children losing free school meals, millions of pensioners losing winter fuel allowance and hit by the much hated dementia tax. The suspension of campaigning following the Manchester bombing outrage was anticipated to take the pressure of Theresa May, but subsequent polling could indicate that massive Conservative cuts to police and border agency are set to be punished at the ballot box. YouGov’s chief executive, Stephan Shakespeare told The Times that the model used on this latest poll had been tested before the EU referendum last year when it consistently put the Leave campaign in the lead. Though there may be big variations yet from as high as 345 seats for the Conservatives, 15 more than in 2015, to as low as 274. A separate survey conducted by OnePoll found Labour now have 29.8 per cent of the votes while the Conservatives are at 32.5 per cent, giving the Government a 2.7 per cent lead with just nine days to go before the country heads to the polls.